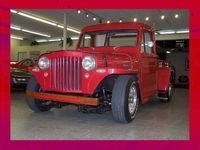 Above is a picture of my 1947 Willy's pickup. My name is Bert Bonem. I started racing 1/8 scale r/c cars back in 1978 when I purchase a used RC100 from a local garage sale. In 1980 I purchase a RC300BD, and used it for the next couple of years. In 1983 I change over to using a RC10. in 1984 I sold both of my 1/8 scale cars, and started racing my RC10 indoors on a carpet track. In 2000 we started collecting 1/8 scale cars.